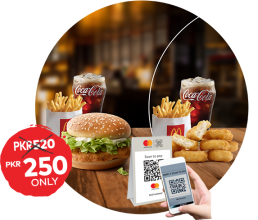 Enjoy 1 McChicken Regular Meal OR 6 pcs McNuggets Regular Meal for just PKR 250 instead of 520 with Mastercard QR. We are also giving away smart phones through a raffle lucky draw- Every Month 5 phones! Treat yourself to bigger savings! 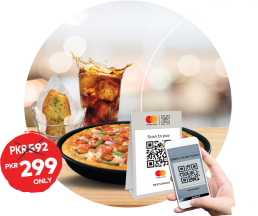 Just scan Mastercard QR to avail the offer at your nearest Pizza Hut outlet. Get PKR 20 instant cash back in your gift card on every PKR 100 retail transaction. 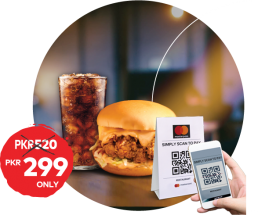 Just scan Mastercard QR via FonePay to avail the offer at your nearest any retail outlet. Use 5 times a day and earn up to PKR 100 cash back. Customer can avail 5 times cashback in a day. 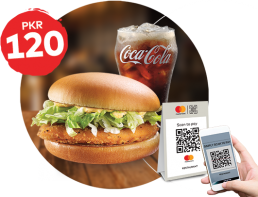 Customer will receive cashback in its gift card wallet instantly upon making PKR 100 transaction. 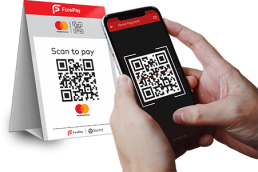 This promotion is for limited time period only and Mastercard and FonePay may amend the rules during, before and after the campaign as its sole discretion. Get PKR 120 mobile load when you buy for PKR 100! Free PKR 3000 mobile load in a month – Avail this offer 5 times a day and 150 times a month!! Select Account and you’re all done! Every customer can avail this incentive 5 times per month. This promotion is valid for a limited time period only. MasterCard may amend the rules or discontinue/terminate the promotion at any time at its sole discretion. 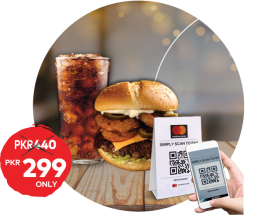 We are excited to announce two amazing deals with Burger Lab on their best-selling burgers for our Mastercard QR base.